Occasionally, whether for financial purpose or expediency; something pretty good is embellished or modified. LEGALLY BLONDE was a 2001 ridiculously-concepted vehicle for Reese Witherspoon. Naturally (for Hollywood) there had to be a sequel, but fortunately, no franchise. What we do have is a musical version with forgettable arias by O’Keefe & Benjamin. 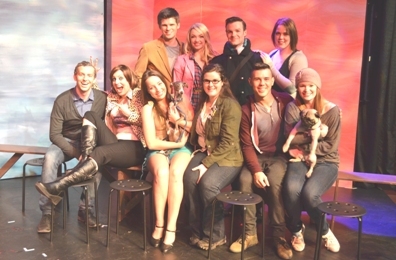 the LEGALLY BLONDE cast & pets!